John Lafferty, B. Tech. in Manufacturing Technology, Cert. Training & Continuing Education, Cert. Quality Management, is a Quality professional with over 25 years experience in the medical device and pharmaceutical industry. John joined SQT as a tutor in 2007. Prior to that, John spent many years working in the Medical Devices and Pharmaceutical Packaging manufacturing sectors – the final 6 years of which were as a Senior Manager of a multinational Medical Devices plant where he managed the Quality, Regulatory, Environmental and Health & Safety Management Systems. John completed his Lean Six Sigma Black Belt training through SQT in 2009 and derives great benefit from applying the techniques that he learned to Risk Management and Validation in a Life Sciences setting. “It is great to be able to bring this knowledge and the experience gained from ongoing involvement with Life Sciences companies into the classroom,” he says. John passionately believes that the key to success in Life Sciences Manufacturing is the relentless application Risk Management and Validation Practices. As the SQT tutor for Technical Writing Skills, John believes that good written communication skills are vital for any Life Sciences professional. "It is important to realise that good writing is less about the rules of grammar and more about stepping into the shoes of the reader and looking at the subject from his/her perspective"
Course gave me great detail on the specific differences between MDSAP and ISO 13485. Tutor kept everyone interested, even during heavy regulatory sections. Good quality of information supplied. Great tutor. Excellent presentation, John’s knowledge and delivery is apparent from the very beginning. John has a very relaxed and easy- going style that made the course enjoyable and easy to follow. He provided anecdotes and examples, which helped us relate to the content. Very informative. Clear communication. No loss of interest – all interesting. 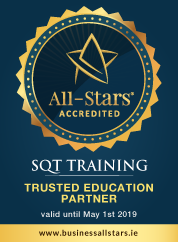 The SQT Training delivered was exactly what this site needed. John is a very engaging and knowledgeable tutor. He delivered the material at a pace to suit the audience and the feedback from the team is very positive. The course material is clear and concise and has set us up for success. When not writing in a technical sense, John likes to do a little creative writing in the form of poetry. He is a regular contributor to the North West Words writers group and describes his style as closer to Paul Durcan than Seamus Heaney. In 2014 John achieved a lifelong ambition and ran the Dublin City marathon. “I had not run a step in the previous five years and went from couch to 26.2 miles in ten months” he says. “I trained every week and then missed four of the vital final seven weeks due to illness, but still managed to keep running for the entire race. It just shows once again that anyone can achieve anything, provided they do the preparation”.